Not kde or kdegames related, but interesting. If you live in the US you can apparently get a free copy of Windows Vista and a free copy of Office 2007, directly from Microsoft. You just have to submit yourself to some brainwas.. I mean… You just have to register and view 3 very interesting webcasts in 30 days, and the software is yours. EDIT on 12/21: according to the site, the promotion has now ended. We are trying to start a new tradition here, so if you are interested in kdegames please add to the agenda at http://wiki.kde.org/tiki-index.php?page=KDE+Games+IRC+meeting and join us this Friday! One week after our IRC meeting and we can already measure some interesting effects. Several applications are being worked on at the same time, johann is doing graphics like a madman, there is constant wiki and IRC activity, and some games have found new maintainers. We also provided status reports for inclusion in Danny’s excellent commit-digest. This combined activity can also be observed in the huge number of commits to the module in the past seven days. I am not a big fan of statistics on commits, because they do not always represent real improvements in code. There is the one file commit that take days of preparation and is the result of an extensive rewrite, or introduces a crucial new feature. And there are semi-automated commits that change a macro in 100 files. Of course, both are necessary for the project as a whole, I am just highlighting the fact that the volume of commits alone is not the best indicator to use to measure project activity. Can anyone explain to me what is the tags module, btw? A few days late, here is a brief summary of our kdegames meeting on IRC. Other people are working on a dot article as well, it should be available soon. 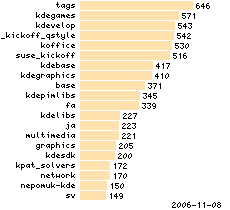 The idea of a monthly IRC meeting to discuss kdegames was well received by the KDE community. The meeting started on time, Wednesday Nov 1st, 7PM UTC. There was about 25-30 people attending, including the majority of active kdegames maintainers, artists, new developers, translators and contributors in general. We had a brief round of introductions and began to tackle the agenda. For reference it is still available at http://wiki.kde.org/tiki-index.php?page=KDE+Games+IRC+meeting . Most people agreed that the game ratings were useful specially to identify which currently non-maintained applications we should prioritize for KDE4. So the question of finding active maintainers for some applications was raised, again. The ones who still do not have candidates and were mentioned specifically in the meeting are libkdegames, ksirtet, klickety, kfouleggs, kolf, atlantik, ksame, ksokoban and katomic. The next issue was about removal of unmaintained games from the module. We also considered the removal of games that are starting to show their age and that were rated low in the survey. One proposal was to remove also duplicated functionality, and some mentioned KSame/Klickety as an example of this, which was not agreed by others. The discussion proceeded for some time, but it was clear that we would not reach a consensus on this. The survey results regarding this topic are also divided. We also agreed to form a review team for kdegames with some of the more experienced contributors, formed by Albert, Pino, Stephan and Johann. The plan is not to tackle the issue of removing games right now, but to re-visit this topic in 3 to 4 months. This gives us more time to find maintainers or contributors that can bring current applications to the level of polish we need for KDE4. There is plenty of time for this, but if no one steps up to maintain an applications, and if it is not polished to a level consistent with the rest of the KDE4 artwork (think Oxygen-quality), then the review team may consider removing it from the main kdegames module before KDE4 is released. For the same reasons, the proposal to move some games from kdeedu to kdegames is on-hold. There is really not much difference to the end user where the applications are inside the SVN tree, the important point is to make sure these are grouped using freedesktop.org standard .desktop categories, which will end up grouping blinKen, KHangMan, KTuberling and Kanagram anyway under the GAMES/KIDS category. It was noted that the games in kdeedu all have active maintainers, so they are in better shape than some in the kdegames module. Colaboration is needed, but we already have developers working on both modules actively. Following the agenda, we then discussed the inclusion of new games in the package. Initial candidates are Kisrk, Kboard, ksudoku and kbilliards. Kisrk and Kboard are already in SVN (playground.) We will invite the developers of ksudoku and kbilliards to join the module. We will follow the KDE procedure for inclusion of new applications, with a move to kdereview before games are accepted into kdegames. There was discussion on the issue of using custom widgets for games. The general consensus was that we do not want to create a new widget set just for games, and will generally use what KDE offers in terms of dialog boxes, toolbars and other widgets. But the in-game GUI do not have to follow this rule, developers are free to use what is more appropriate for buttons, text areas and other control elements. A good example is blinKen. The in-game elements should preferrably be themeable as well. It was suggested that all games for KDE4 ship with at least one Oxygen-like theme, for visual consistency. Johann is already working on this and has checked in a suggestion for KWin4 as a start. Other games that are already being revamped following the “kdegames guidelines for KDE4” are KMahjongg, Kpat and KReversi. All in all, a very satisfactory result, considering it was a first meeting, and the chaotic nature of IRC communication. In the end we agreed to repeat the meeting experience next month. Scheduled time will be announced via kde-games-devel, and wiki.kde.org.